A homemade blueberry pie recipe using phyllo pastry to make a crust and a lattice top, saving you the trouble of the most time-consuming part of making a pie—the crust. Using phyllo pastry makes it foolproof, and makes the crust nice and flaky—all the better to show off the delicious blueberry filling! Made from just a few simple ingredients, including blueberries, sugar, and flour, this is a simple, easy, vegan egg-free and dairy-free recipe. No egg substitute needed! It can also be made with lemon. Of course, this is just one of many vegan pies you can make for a scrumptious dessert. 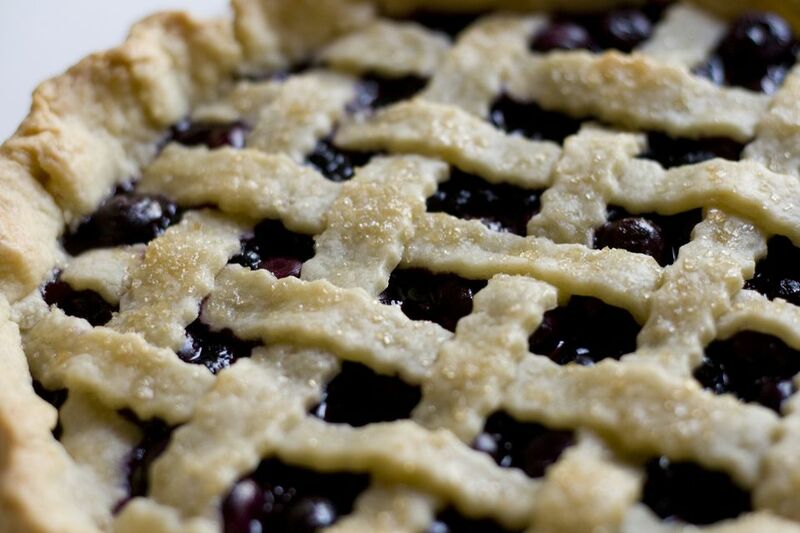 This homemade blueberry pie recipe is courtesy of Wild Blueberries. First, lightly coat a 9-inch pie pan with nonstick spray. In a small bowl, combine the 2 teaspoons of sugar and 1 teaspoon of flour and set aside. Stack all of the phyllo sheets together (4 or 5, keeping one for the lattice top crust) and then cut them in half crosswise. Cover the sheets with a slightly damp cloth until ready to use. Take one phyllo sheet and layer it on the pie pan. Coat it lightly with the vegetable oil spray and sprinkle about 1/2 teaspoon of sugar mixture over it. Repeat with remaining sheets, layering clockwise at 1” intervals until entire pie pan rim is covered. Trim excess phyllo with kitchen shears. In a large saucepan, combine sugar, cornstarch, and cinnamon and mix well. Add fresh blueberries and sprinkle with lemon juice. Toss lightly to combine. Cook and gently stir over medium heat until mixture comes to a boil. Cook and stir 2 additional minutes. Remove from heat and transfer to prepared phyllo crust. Cut phyllo sheet in half crosswise. Lightly coat each half sheet with nonstick vegetable-oil spray. Stack the 2 layers and fold lengthwise then cut into 6 strips. Twist the strips and arrange them over the pie filling. Bake your homemade blueberry pie for 20 to 25 minutes, or until the phyllo is lightly crisped and golden. Blueberry pie is best served fresh but at room temperature, so allow your pie to cool but then serve it up as soon as possible.